Sara Gilbert is an American actress who shot to worldwide fame portraying Darlene Conner on the ABC sitcom Roseanne. She reprised the role in 2018 for a nine episode revival. She is co-host and creator of the CBS daytime talk show The Talk and has had a recurring role as Leslie Winkle on CBS’s The Big Bang Theory. Sara Gilbert was born on 29 January 1975, in Santa Monica, California, U.S.
She’s currently 44 years old. Sara Gilbert attended Yale University from where she graduated with honors, majoring in art with an emphasis on photography in 1997. 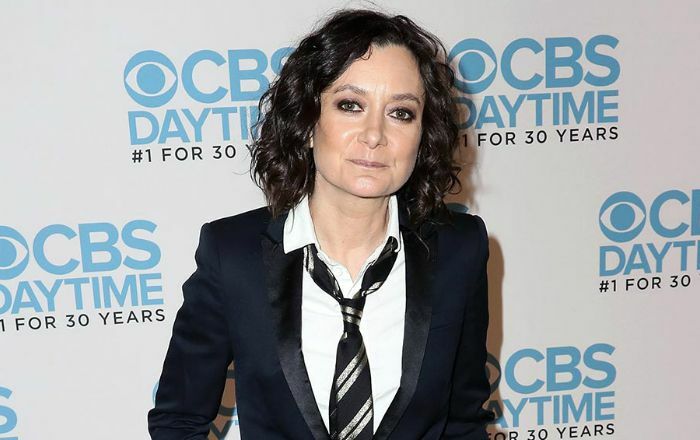 Sara Gilbert began a relationship with songwriter, music producer Linda Perry and married on March 30, 2014. Gilbert gave birth to their son, Rhodes Emilio Gilbert Perry, on February 28, 2015. Previously, she was in a relationship with television producer Allison Adler with whom she has two children – a son, Levi Hank, born to Adler in October 2004, and a daughter, Sawyer Jane, born to Gilbert in August 2007. The couple announced their separation in August 2011. She also briefly dated Roseanne co-star Johnny Galecki. Sara Gilbert made her onscreen acting debut in the 1992 film Poison Ivy where she played the role of Sylvie Cooper. She was nominated for Independent Spirit Award for Best Supporting Actress. In 1984, she was cast as Jean in a television film Calamity Jane. Four year later, she starred in an episode of ABC Weekend Special for her role as Stephie. Her first leading role came in 1988 when she starred as Darlene Conner-Healy on ABC sitcom Roseanne. She appeared in a total of 184 episodes. She also reprised the role in 2018 for a nine-episode revival. Her role as Darlene Conner-Healy in Roseanne (1988 – 1997) as well as her work in the talk show, The Talk (2010 – Present). Sara has a net worth of $16 million. She lives in her Hollywood Hills house that boasts all amenities including a swimming pool, Jacuzzi and sauna. Gilbert is the granddaughter of famous comedy writer Harry Crane. She ranked #38 in VH1’s list of the 100 Greatest Kid Stars for her role in Roseanne. She is a vegan, though she admitted to eating seafood occasionally. Gilbert received two Primetime Emmy Award nominations for her performance in Roseanne. She also appeared in the popular television series The Big Bang Theory. Following several years of speculation about her sexuality, Sara admitted that she was a lesbian before the launch of her talk show, The Talk in July 2010.